Breadcrumb NavXT WMPL Extensions improves Breadcrumb NavXT’s support for WPML Multilingual CMS. With Breadcrumb NavXT WPML Extensions, string based settings within Breadcrumb NavXT and Custom Post Type root pages are now translatable within WPML Multilingual CMS. 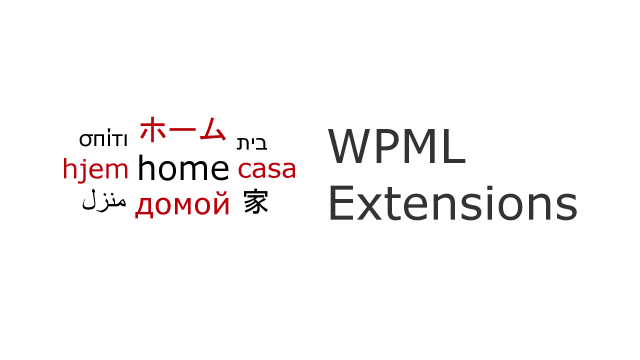 WPML String Translation – This comes as part of purchasing WPML Multilingual CMS, and is not part of WPML Multilingual Blog. Bug fix: Fixed PHP error caused when WPML Extensions was the only extension plugin active on a site. New feature: Enhanced compatibility for Menu Magic and WPML (works out-of-the-box without setting “Adjust IDs for multilingual functionality” in WPML). Bug fix: Fixed PHP7.1 compatibility issue. Bug fix: Fixed issue that caused strings to not apply the translation in some environments. New feature: Enhanced WPML 3.2+ support via support for the WPML 3.2+ API. Bug fix: Fixed issue where updated settings from Breadcrumb NavXT would not immediately show up in the string translation screen on non-multisite installs. Bug fix: Fixed issue with wiping out certain HTML tags in the HTML accepting settings fields when activating a license via the activate button. Bug fix: Fixed issues experienced by users when activating license keys.